I'm very glad my mother-in-law taught me how to make three dimensional Pennsylvania German folded stars. She learned the technique from a neighbor more than fifty years ago and has shared the directions with quite a few friends and family. Made with four long (24 inch) strips of lightweight paper (similar to regular computer paper) they're really quite easy once you get the hang of the folding steps (older children can do them too) and she and I always enjoy getting together to make a batch. At times we leave them plain white and other times dip in melted paraffin and sprinkle with fine, clear glitter. We've given them as gifts and decorated trees for our local hospice's Festival of Trees... so pretty with all white stars and tiny white lights. The stars make an easy table centerpiece - just fill a decorative bowl - or string them on metallic cording for a mantel garland. They can also be hot glued on a wreath or use one or more on a package in place of a bow. We purchase pre-cut strips at the Ephrata Cloister shop in Pennsylvania, but High Hopes sells the strips online; it offers good directions and other project ideas too. I came across a helpful post at Grateful Prayer Thankful Heart for making folded stars that features video directions too. And Down Abbie's Road blog offers a lovely idea for making the stars from old sheet music. Apparently lots of us enjoy these folded stars... hope you will too. Happy folding! Stay tuned for directions for the folded German Bell Ornament that can also be seen in the picture - believe it or not, it's made from a simple index card. Hi Ann! So nice to stop by and meet you! I will have to go back and see your past posts as you have such a great blog here. Thanks for the link to my place about making the stars. These are one my favorites! They are also called Moravian stars. I have a number of customers who make these using the wider quilling paper (it's 24" so it's perfect), the pearlized paper makes stunning stars! Someone sent me a picture of the stars done in fall colors in an arrangement with sunflowers. I had always thought of them for use at the holidays, but these changed my mind! Thank you so much for sharing Ann!! 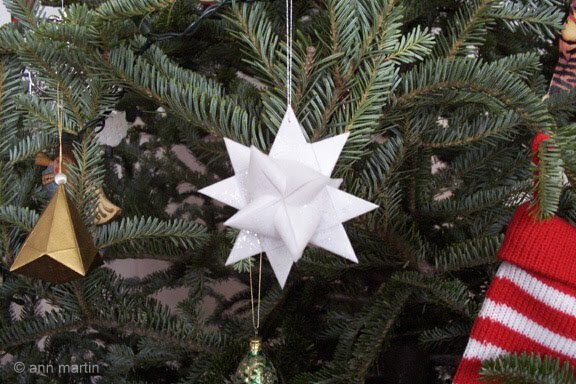 "Simple paper decorations made from four folded strips of paper are sometimes also called "Moravian" stars, but are known as German stars, Swedish stars, or more correctly as Froebel Stars, named after Friedrich Fröbel, the German educator who invented them." Great point about making them with the pearlized quilling strips... they would be beautiful. The narrower the strip, the less length you'll need. Where can you purchase these Froebel Star ready made? I bought the paper from them and I really enjoyed making them myself but if you don't have the time or just don't have the patience, you can order the stars already made at a very reasonable price. 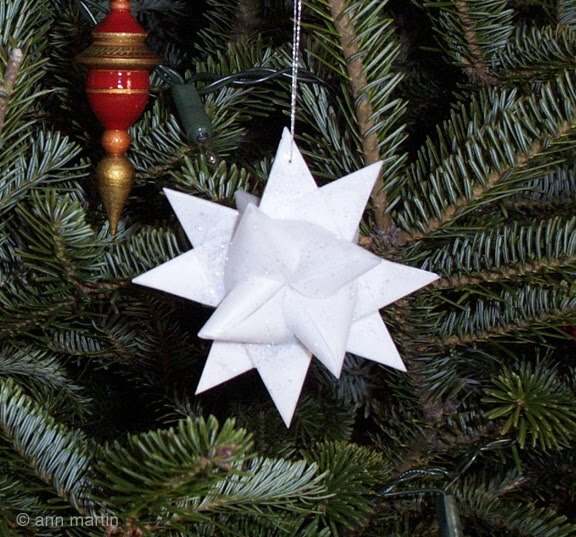 Have you noticed how much paper strip you cut off when "finished" your star? I use the remaining strip to create another layer, and it works out perfectly with no remaining paper! You can have a look at my "Folly with Froebel" here. I hope you enjoy trying it out! Thanks for letting us know about the variation and your video!